Russia, Peter the Great. AD 1689 to 1725. Silver Kopek. Date : This example is dated but only part of the final digit on the date is on the flan. 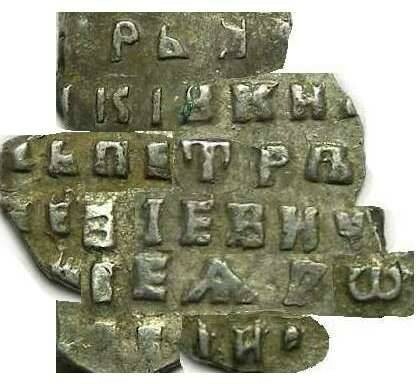 It is mostly likely 1704 via a cyrillic date code below the horse, but it could also be 1709. Size : 10.0 x 7.0 mm. Weight : 0.26 grams. This is a fairly small coin. Grade : VF, and in spite of being a slightly smaller than usual flan, it has more of the horse man than one normally sees on these. Obverse : Horseman riding right, with part of a Cyrillic letter below that is part of either 1704 or 1709. Reverse : Cyrillic inscription naming Peter as Czar. Below is a composite of most of the reverse inscription as it might have appeared on the dies, although the exact letter forms on each die could vary considerably, and so this is only a theoretical die. One think that can cause confusion, is that the T in PETER often looks more like an M on many specimens.